Wonderful old photos, I really enjoy seeing these street scenes. I always look forward to your now and then articles, thanks for sharing! Any luck finding that old film? 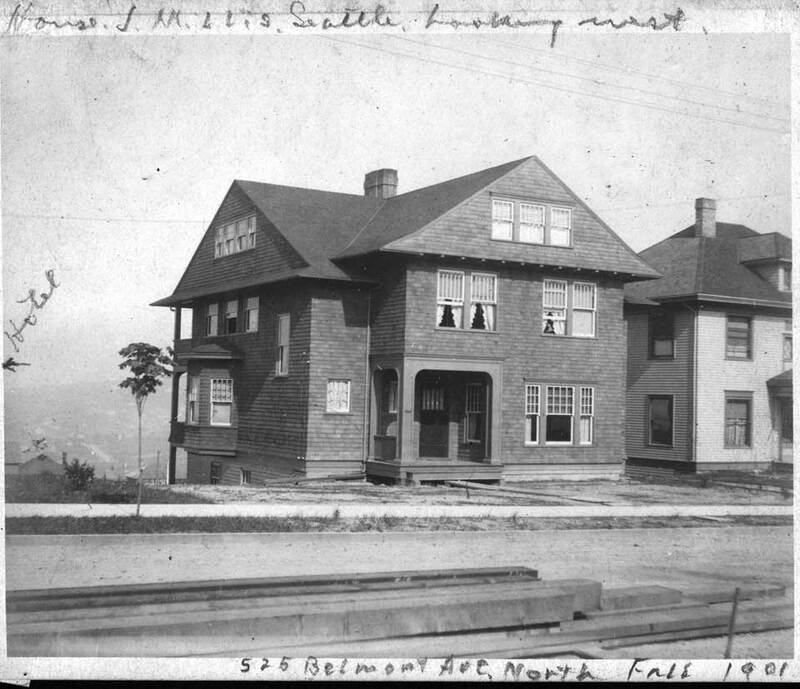 I love these pictures – I actually live in the apartment building at 525 Belmont now. I would love to get copies of the pictures for the building – how could I contact you to see it that would be possible? I’m holding onto my timbers. 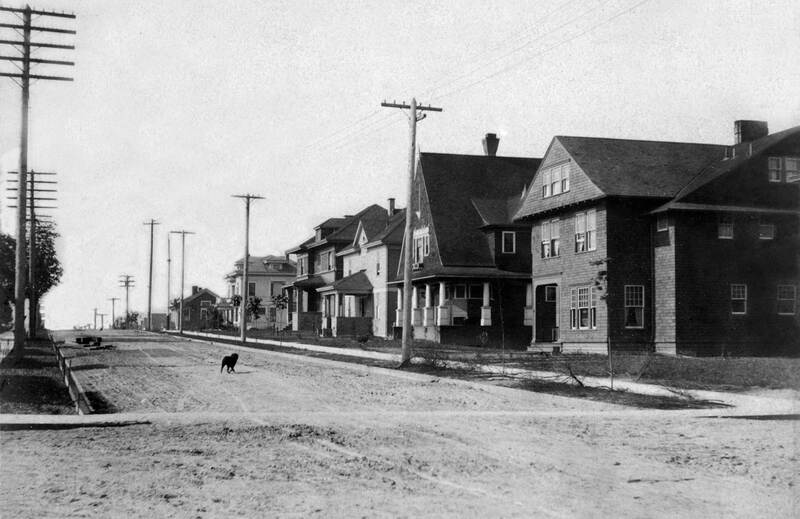 I have another photo by Millis that looks north on Belmont towards the Millis family home site but for that moment sans his home. However, the two homes to either side of the future Millis home are in the picture. This includes to the south that handsome structure with the steep roof and – whopee! – the home on the corner. So although that home does not show up in the primary then-now photos we put down, it is there and so, no doubt, just off the frame/format to the right. Odd thing is – and here my perception agrees with yours – that in the photo that looks west across the timbers in the street and to the Millis home and that also shows the home on the corner, it does not seem possible that given the relatively little space between the two homes – the Millis and the corner home – that it should not also show up in the principal photo. And hence you may have concluded that those timbers could not be the same otherwise they would have rested there through the entire construction of the corner home. This was also my conclusion when I was fumbling through the album – until – until I came upon the other photo that I have just described above. Pity I cannot show it to you but I do not feel confident in trying to insert it, and Jean who is away producing a play at Hillside School will need to do it this evening when he returns to his Green Lake home. So for this moment please trust me, but not for longer than one day. Jean should get that evidence up tonight. 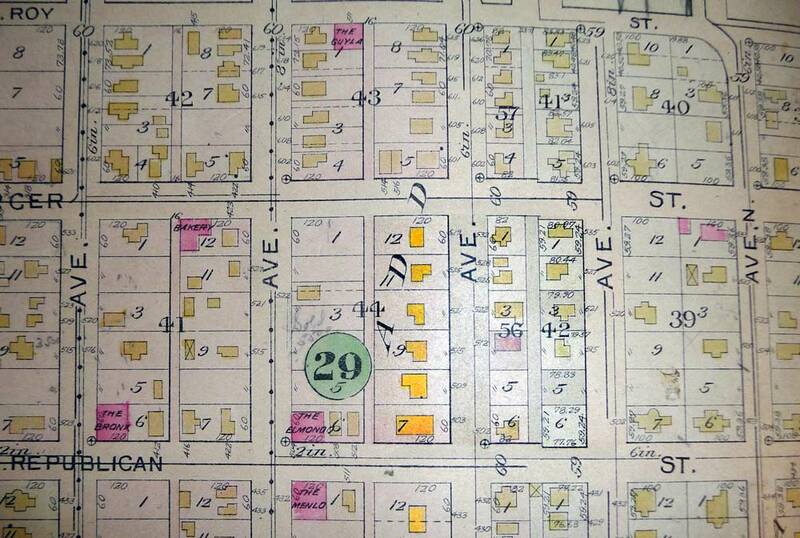 I’ll also send him a semi-crude snapshot I took of a detail of that block from a 1912 real estate map. In that detail I have saturated (made more dense and brilliant too) the color (yellow) of the six houses on the block as well as the one across Republican on the southwest corner of Republican and Belmont so that they will stand out. In the footprints of those homes the one on the southwest corner of Belmont and Mercer – again the neighbor of the Millis home to the north – does not reach as close to the sidewalk on Belmont, and there is another reason why it has a chance of escaping direct inclusion in the photo we primarily wrote about. By the way we will want to repeat that ca.1900 pan from the Millis site west to the Queen Anne horizon and will need to get into an apartment in northerly most of those two big ones. I don’t think it is the Lamplighter. That is the southerly one. Do you know the manager? Or the name? … of the apartment house. The apartment house is actually a condo called the Highlander (525 Belmont). Check with mjenkens for entry. 3rd or 4th floor should do for a now photo. Thanks for the new Millis photos. I guess I have to agree with you. But what a strange optical illusion. The case of the disappearing and reapearing house! I have most of the ’37 tax photos of these houses if you want to see them. It may interest you to know that extraordinary high prices were paid for all 6 houses in the early 1960’s in order to compile the lots necessary to build both condos. The owners were paid at least 3 times their market value. Also, after doing some research, the sycamore trees are indeed the same ones in the then and now views. Many homes in the earlier western panorama are still standing as well. Ken – I am on the 2nd floor – I would be happy to let you in to take photos. Last week I went searching for “Another Millis mystery”. I think I’ve found where it used to be. Interestingly, the location shows up in your extract of the Sanborn map, but the shapes on the map don’t seem accurate enough to identify it. 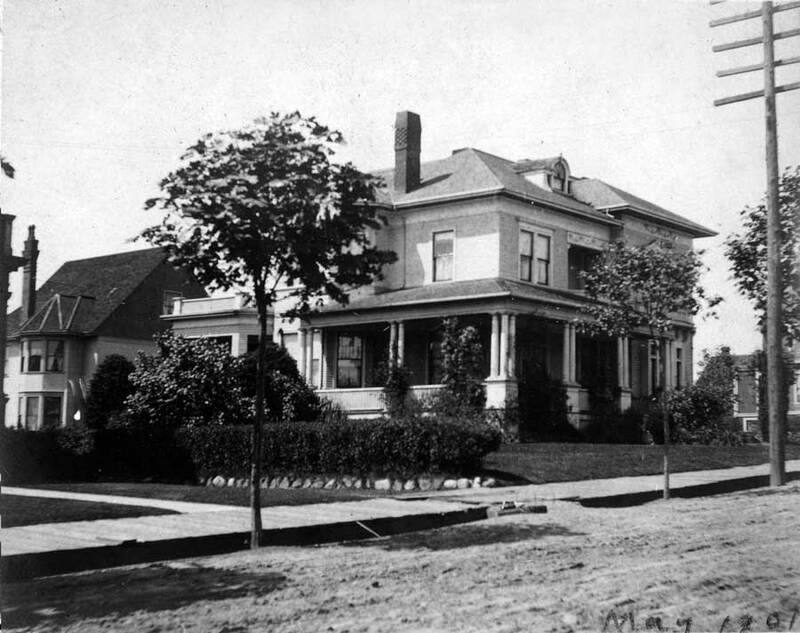 The house appears to be on a corner, as the house to the left seems to be facing on another street. Based on the shadows it looks like a southwest corner. The unique shape on the back of the house on the left combined with the one story porch roof of the mystery house seemed to also be good clues. So I went perusing the Sanborn maps in the area. The porch, the back of the house at left, the bay bumpout on the south side, both houses 2 1/2 stories, it seems like a good match. The back portico seems to be missing, however–perhaps it was taken down. And it satisfies the major criterion of being near the Millis house. There is some irony here because it is in your Sanborn map–but the detail is not sufficient to recognize it. Today of course the house is gone. 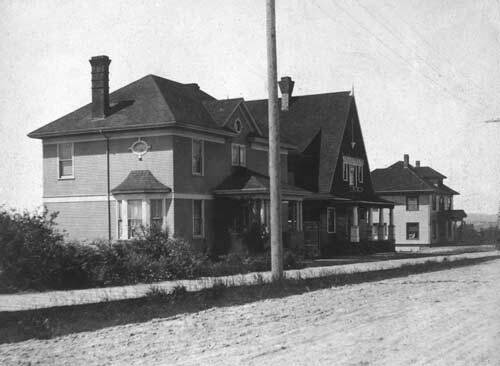 In 1919 it was the home of the Mme Pless Day and Boarding School (Myra Pless). Myra lived in the house. It is advertised in the 1923 Polk Directory as “A Home for the Girl from Eight to Twenty, Accredited College Preparatory, All Grades and Kindergarten”. In 1920 she’s listed in the census as “Principal, Private School”, living in the house with her daughter Madeline, and a servant and a maid. She was from Alsace region of Germany, and arrived in the U.S. in 1906. She was widowed according to the census. Madeline Pless was a dear friend of my family. I spent many happy hours in that beautiful home. They still lived in the home after the boarding school had ceased operations. Madeline married Harold Spaulding, who then also lived there. Madeline was a classical pianist, and Harold had a lovely tenor voice. They used to entertain frequently, and always presented a musical performance. I have the round oak clawfoot table which was in the kitchen of that home. To the best of my knowledge the house was torn down to build the new library on that property. What a shame!! They then built a small home on the corner of 55th and Latona, near where my family lived. While the new house was being built Madeline and Harold lived with my family. Mme. Pless stayed with other friends during that time. She lived to be a very ripe old age, and we always called her Mme. Pless. I didn’t even know her first name until I read this article. And I like 416 Harvard as the address for the first mystery photo–based on the front porch outline. The shadows fit well, as if the photo was taken minutes apart from mystery photo #2. The trees are similar, and it’s just 1/2 block away south on Harvard. Might be hard to confirm as I think the Broadway market came thru there in the late 20’s. Here’s a link to a JPEG of the Sanborn map of the street I created. 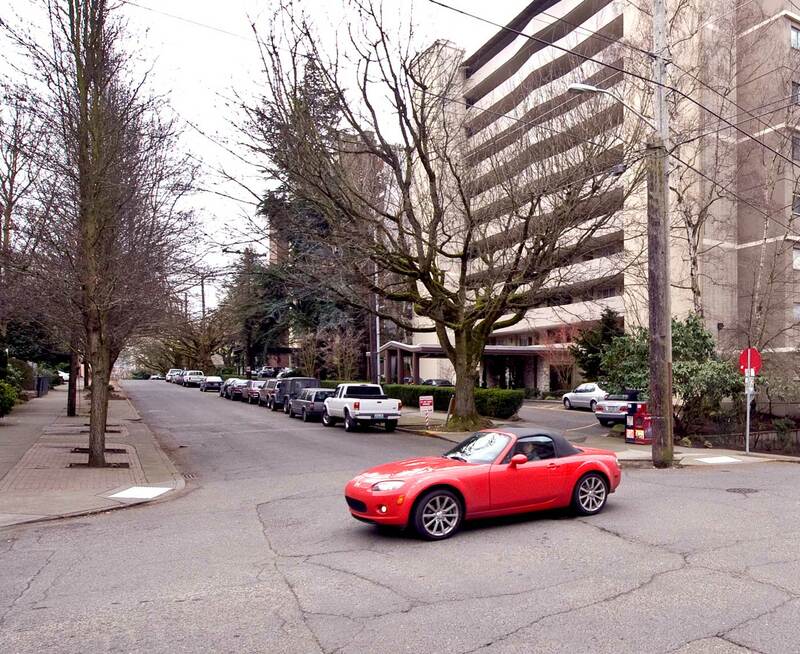 I think the two mystery photos are of the 600 block of Belmont (between Mercer and Roy). The first would be the east side of the street. None of the buildings are there, but most of the grassy incline still is. That block and the 600 block of Summit Ave are the only two blocks in the area that have flat streets and homes built on an incline. Looking at them today, Belmont looks much more like the photo than Summit. 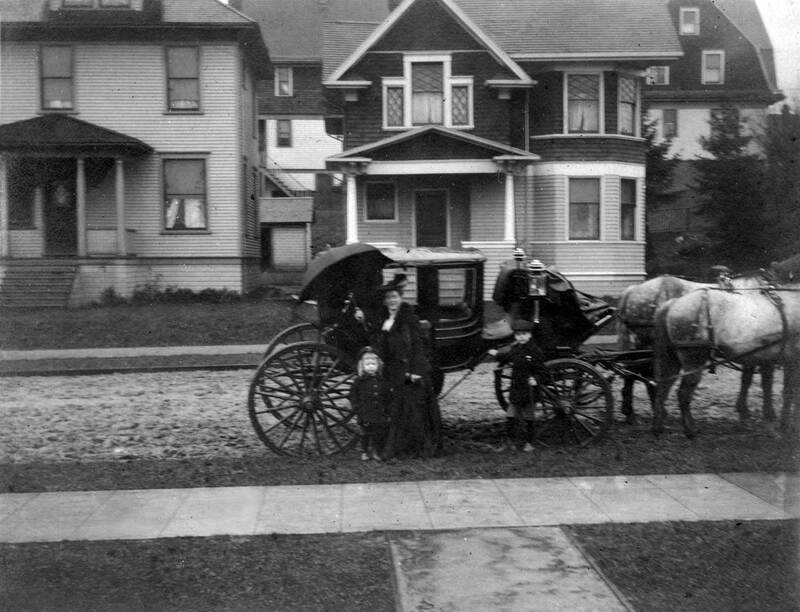 The second photo (more difficult) I think would be across the street on the west side where the Shannon condominiums are today. 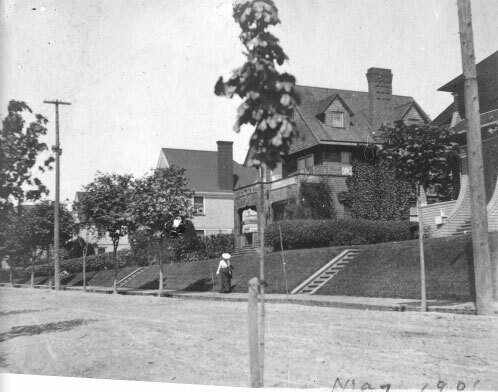 The house in the background on the right could be (what is today) 730 Belmont Ave E (where the street curves and goes downhill). The telephone poles in all the photos are intriguing. Specifically, I’m referring to the one in front of Millis’s home that keeps disappearing and reappearing in the photos.